Discover cheap holiday packages to Christchurch from Auckland, Wellington, Queenstown, and more. 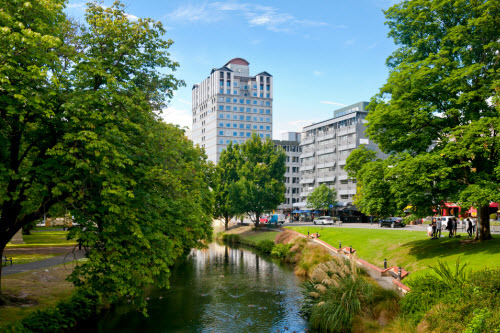 Known as "The Garden City", Christchurch is a hub of creativity, adventure and vibrant culture. While the city was severely damaged a few years ago by an earthquake, it's slowly rebuilding itself and reclaiming its spot as a top NZ destination. Is planning your trip to Christchurch stressing you out? Easily browse and book exclusive package deals at Webjet. Our holiday packages include cheap flights to Christchurch and hotel stays for the duration of your trip. Don't spend hours comparing prices online. Let us find the best holiday package to Christchurch for you. Christchurch is a city of gardens, churches and more recently powerful earthquakes. Located on the South Island, it's a gateway to some of New Zealand's top outdoor adventures and breathtaking scenery. You'll find golf courses, bungee jumping, mountain biking, hot air ballooning and so much more. Domestic flights to Christchurch are very affordable with roundtrip fares starting at NZD 40. Bus fares in the city cost NZD 2.55 for a single trip, and if you get a MetroCard, you can expect to pay around NZD 8.50 for a ride to the airport. With great transportation savings like these, Kiwis have more money to splurge on bucket list activities and swanky Insta-worthy hotel rooms. Families can catch a ferry to Quail Island (keep an eye out for Hector's dolphin). Nature lovers can go on a nocturnal kiwi tour inside Willowbank Wildlife Reserve. Culture vultures can learn more about the Maori culture by visiting Kotane with packages including a traditional performance and four-course meal. Christchurch is also the hub of festivals in New Zealand. From the Chinese New Year Parade to the 10-day Festival of Romance, there is usually something happening every month. 1. Weather: The best time to visit Christchurch is during spring. From September to November, the new season brings with it blossoms and The Garden City lives up to its name. December to February is another popular time to visit. With 40 swimming beaches close to the city, it's the perfect summer getaway. June to August is Christchurch's winter season, but it's still a busy time to visit thanks to its 13 nearby ski areas. 2. Getting Around: Ditch the car and explore Christchurch on foot or with public transport. Or, hire a car and visit the hard-to-reach places like Taylor's Mistake, Sumner Beach or Lyttleton. 4. Wi-Fi: Christchurch has over free WiFi hotspots located across the city. All you need to do is connect to 'Telecom Free WiFi'. 5. Airport: Arriving and departing from Christchurch Airport is hassle-free. With only a single terminal for international and domestic flights, you don't have to worry about navigating through a huge building to reach the arrival or boarding gate. 6. Free Walking Tour: If you want to learn more about Christchurch's history, culture and architecture sign up for a free walking tour.